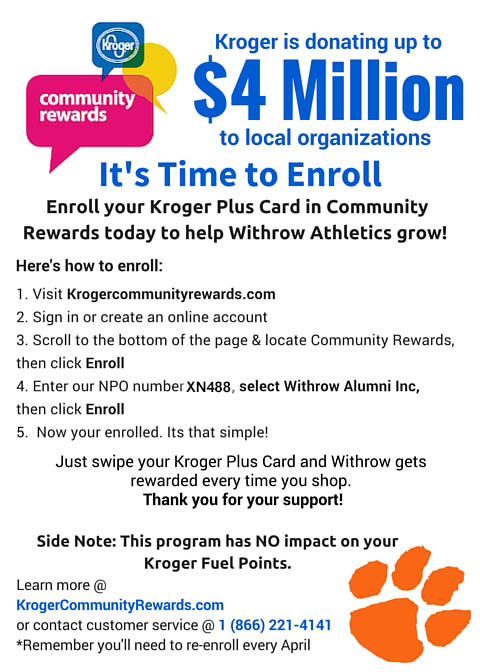 Help Withrow Athletics NOW by enrolling as a Kroger Plus customer at krogercommunityrewards.com Next, enter your Kroger Rewards card no. and then, go to the Community Rewards screen, search for Withrow and select Withrow Alumni Assn. CONGRATULATIONS!! Kroger will make a donation to the Withrow Alumni Assn. each time you make a Kroger purchase until their promotion fund is gone.